Sometime between 11/25/14 and 11/27/14, a thief or group of thieves, stole a calf from the 4000 blk of N. Progressive Rd. in Deaf Smith County. The Sheriff`s Office is asking for any information about this theft and Crime Stoppers if offering a reward up to $500 for information that leads to the arrest of the individual or individuals involved. The community is urged to call Crime Stoppers. Your identity will ALWAYS remain anonymous. Sometime during the month of March, a thief or group of thieves, forced open a transformer at the old Caviness Plant west of Hereford. The thieves cut and took all of the secondary copper wire from the transformer. Deaf Smith County Electric Cooperative Inc. will add a $500 reward on top of what Crime Stoppers will pay if your information leads to the arrest and conviction of the suspects. The community is urged to call Crime Stoppers. Your identity will ALWAYS remain anonymous. Deaf Smith County Crime Stoppers is asking for your help in finding the persons responsible for a Burglary of a Building at John Pitman Golf Course. Sometime between 8:00 pm on Friday, March 21 and 8:00 am Saturday, March 22, 2014 someone entered the barn used to store golf carts and took a Club Car brand golf cart. Crime Stoppers will pay a hefty reward for the recovery of the golf cart and or information that leads to the arrest of the suspect/s. Once you call Crime Stoppers, you will never be asked your name or phone number. To give a tip on this crime or to learn more on how the program works, call 344-CLUE (2583). For years burglaries in Hereford have been a problem. Whether it is your home, business, storage shed, or your vehicle, a burglar takes more than just your property. He takes a piece of your security with him. Burglaries and drugs go hand in hand and both are becoming out of control in your city. Crime Stoppers urges the community to call the clue line if you have information on these crimes. Crime Stoppers pays good rewards to people that give specific information that leads to an arrest or the recovery of narcotics or stolen property. Its time for the citizens of Hereford to take their city back and make the thieves and drug users move on. Crime Stoppers wants you to know that “Tippin aint snitchin” and you will remain completely anonymous. Help make your community a safer place. You tip us and we’ll tip you! Deaf Smith County Sheriffs Office is asking for help in identifying the suspect in a recent theft and vandalism that occurred on N. Progressive Rd. On 06-30-2013 between the hours of 11:00am to 12:00pm, suspects stole the rims and tires off of a 2002 Hyundai SUV. The suspects also broke several windows on the car and took the battery as well. Anyone having information on this crime is asked to call Crime Stoppers or the Deaf Smith County Sheriffs Office. Crime Stoppers wants to pay for information leading to the arrest of the persons responsible for the damage done to the green of hole # 15 at John Pitman Golf Course in Hereford. Sometime during the nighttime hours of 04-25-2013 suspects drove a vehicle over the green causing severe damage to the turf. Crime Stoppers asks the community to call 344-CLUE(2583) with information on this crime or to find out how the program works. Crime Stoppers has paid out thousands of dollars in the past and wants to pay many more thousands to callers with good information. Over the last several weeks, person/s unknown have broken into numerous storage buildings in and around the city of Hereford. Deaf Smith County Crime Stoppers wants to pay a large reward for information that leads to the arrest of the person/s responsible. To report what you know, or to find out how the program works so you are never identified, call Crime Stoppers at 344-CLUE (2583). Crime Stoppers is looking for the person/s responsible for a burglary from a garden center on West Park Ave. The burglary took place between 3-27-2013 and 04-05-2013. Taken from the burglary were three gas powered Stihl chain saws and three blue colored 5 gallon gas cans. Crime Stoppers will pay a HEFTY reward to anyone that leads police to the arrest of the suspects or the recovery of the stolen property. On 01-25-2013, Deaf Smith County Crime Stoppers hosted the Harlem Ambassadors basketball team at the Hereford Junior High Gymnasium. As Hereford families enjoyed the fun and excitement inside, Hereford thieves burglarized numerous vehicles in the parking lot outside. Crime Stoppers WILL pay a LARGE reward to any person/s that has good information that leads to the arrest of the crooks or the recovery of the stolen property. Deaf Smith County Crime Stoppers intends to bring more fun and excitement to Hereford and will not tolerate the punks that attempt ruin the fun. Crime Stoppers is yet again asking the community of Hereford and Deaf Smith County to help solve a serious crime that happened within our county. Sometime during the overnight hours of 10-01-2012, some unknown crooks broke into a barn on County Rd. HH. 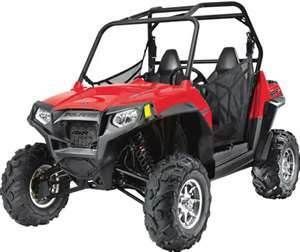 After entry was made into the barn, the thieves stole several items such as a high lift jack, an air powered grease gun, several end wrenches, and a red Polaris Ranger 800 ATV which is valued at over $10,000. A photo of a ranger similar to that which was stolen can be seen on the Crime Stoppers web site at www.344clue.com under crime of the week. Crime Stoppers WILL pay a lot of money for the arrest of the suspects, and or the recovery of the stolen ATV. Crime Stoppers is asking the community for information on the person/s that broke into a business. Crime Stoppers wants to pay good money for the recovery of the property or the arrest of the suspects. Sometime during the evening and overnight hours of 10-17-2012 someone broke into a business in the 900 block of Dairy Road. After the burglar/s entered the building, a Miller Welding gun with about 100’ of lead was taken. The suspects also took a truck radiator. To find out how the program works and how you remain anonymous, call the Clue Line. Over the last several weeks, there have been numerous fires reported to the Hereford Police and Hereford Fire Department. Deaf Smith County Crime Stoppers is asking for help in identifying the person/s responsible for the fires. Most of the fires have been set in dumpsters, however on 11-07-2012 a fire was set to an abandoned mattress in the alley to the south of the 400 block of Sycamore Lane, just behind Tractor Supply and Stevens Chevrolet. The fire spread and destroyed a communication pedestal. Estimated damages were said to be about $10,000.00. Anyone with information on who started this fire or any other fire is urged to call Crime Stoppers. Crime Stoppers will pay a hefty reward for the arrest of the suspect/s. Crime Stoppers also reminds you to call police or 911 if you see or hear any suspicious activity around your home or businesses. Crime Stoppers wants your help in identifying the suspects that broke into a business on Thursday July 26th between the hours of 5:30 pm and 8:00pm. The business is located in the 100 block of Funston. The burglars entered the business by cutting a hole in the back side of the building. The thieves then attempted to take numerous car parts and other items in the building. Burglaries and thefts are still on the rise. Crime Stoppers reminds everyone to secure your property by locking your doors and windows to your homes, businesses and vehicles. For other crime prevention tips, contact Crime Stoppers. Crime Stoppers needs help identifying the suspect in a recent stabbing at Wal-Mart. The stabbing occurred on 5-26-2012 about 9:40pm. Possibly fueled by road rage, the driver of a mid 90s Dodge Dakota extended cab pickup stabbed a second subject numerous times before fleeing the scene. Crime Stoppers and police are looking for information on who the suspect is. Part of the surveillance video can be seen on the Crime Stoppers web site at 344-CLUE under crime of the week and “wanted suspects”. Crime Stoppers needs help in locating the suspect/s in a theft of approximately 40 truck tires from a business in the 100 block of W. 1st St. The tires are said to be recaps with Michelin molding tread. The tires were taken from the business after a building was broken into around May 20th. If you know who took the tires or know where the tires may be located, you are eligible for the reward. Crime Stoppers needs help in identifying a subject that robbed a local apartment complex office. On 6-1-2012 at approximately 4:30 pm, a male subject wearing a black hoodie and a red bandanna entered the office of an area apartment complex armed with a gun. The subject was described as a skinny male that stood about 5’8” tall. After entering the office, the subject then gave orders to the manager to give him the money. The suspect took an undisclosed amount of money before fleeing out the front door. Deaf Smith County Crime Stoppers is asking for help in locating the suspect/s that burglarized the VFW sometime during the overnight hours of Sunday 5-27-2012. After the suspects entered the business numerous bottles of liquor were taken. Also taken was a black safe with gold trim and an undisclosed amount of cash. Before leaving the building, the suspects broke the jukebox and pool table taking that money out of the two machines as well. If you have information on who committed this crime or the location of the stolen property please call Crime Stoppers at 344-CLUE (2583).